Did you see the Airbus A380 in Manila? If you didn’t, head on over to Anton Lorenzo’s flickr to see the A380 as it lands on NAIA. Or head on over to Yahoo and see the NAIA staff having their pictures taken with the A380 in the background Even more photos at the Pinoy Photography Forum and at the Digital Photographer forum. MANILA, Philippines — Airbus’ extra-large A380 jetliner flew into the Philippines on a test flight Thursday to show it can be flown to existing runways in Asia, company officials said. The A380 flew from Melbourne to the Manila international airport, landing smoothly with room to spare and taxiing to a parking area without a hitch despite its larger size. “The landing had no troubles at all, absolutely no problem,” said test pilot Peter Chandler at a press conference afterward. 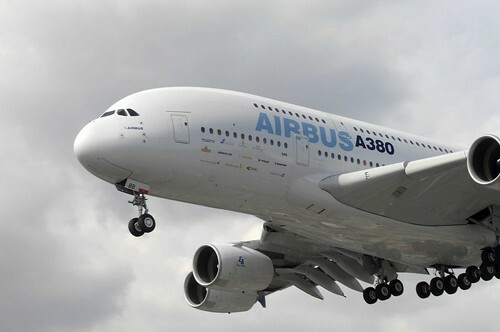 Airbus senior marketing manager Julian Manhes said this was part of test flights by the A380 to show it could land and could “fit in today’s airport infrastructure,” with no need for any adjustments to accommodate the aircraft. The Airbus A380 test plane MSN009 will stay overnight at NAIA, taking off around 11am tomorrow for Clark. There will be a public viewing on Friday, October 12 at the Diosdado Macapagal International Airport. Viewing time is from 12 noon until 4 o’clock in the afternoon. RELATED: PAL to operate NAIA3? You saw it land? Nice! Where were you standing ba at nasita kayo? Sobra naman yun! This is so cool! I wonder what it’s like inside. hey, you’re back in Australia? Hi Ferdz! Yup, I’m back in Melbourne until December. Ang lamig, grabe! Nakakainis pa kasi people are saying it’s getting warmer na daw hahaha. Tutubi: Yup! The first commercial flight of Singapore Airline’s A380 is on the 26th of October from Singapore to Sydney. I’m looking forward to reviews about the Singapore Airline Suites. i saw it the window behind my desk at the office. napasigaw na lang ako when i saw it. super laki! there’s this hissing sound before I saw it. i just wish i can ride in an a-380 soon!